'Today, a large number of young people have amazing ideas for this country. The youth is willing to believe that we can make it work. I am one of them,' says Malvika Bhatia who works for a non-profit organisation aimed at addressing voter apathy amongst India's youth. Perhaps India's greatest quality remains its ability to thrive in spite of its extreme diversity. There is, without a doubt, no other country in the world that has as diverse cultures as India. Cities such as Mumbai are true melting pots of culture where each retains its identity yet comes together to make a complete whole. I've lived in London which people call a cosmopolitan city, which in so many ways it is. There is, however, a uniformity there that you will never find anywhere in India. Every locality, every city, every state, has character that makes it stand out from among the others. It is what defines it and what makes it so unique. Each place is so different from the other that sometimes you wonder how we have made it work for all these years with so many differences. Despite the differences I believe we are united by the notion of India, one that we are proud of, one that drives us to work towards a greater good. There is also, of course, our shared history, our struggle against the colonial powers that binds us together and makes us aware and despite our differences, there is a greater problem lurking around the corner that needs us to be together to be solved. Poverty remains our greatest challenge; our inability to provide nutrition and housing to our people is yet another issue that plagues our country. All of this is interlinked with the problem of our ridiculously large population. What many of us don't seem to realise is that all of these problems can be corrected by responsible citizenry and good governance. It is easy to put the blame entirely on the government and say it is corrupt but it is equally difficult to hold it accountable. This is what we try to overcome at Know your Vote by asking people why they are not using their right to vote. Voting is really the very least we can do as part of a democracy. I am often told that voting does not matter, that it is really a choice between two major and perhaps equally corrupt political parties -- that it now boils down to just Narendra Modi and Rahul Gandhi. Sadly, it is too simplistic an approach to take. Why can we not rather look at our own constituencies and ask ourselves who will do our constituency some good and then vote for her/him? How often do we even know who is contesting from our area? Why can we not instead vote for an independent candidate who shows some promise rather than one from a major political party who may not be able to bring about any major change? The problem, and this is more pronounced in cities such as Mumbai, is we are not as politically aware as we should be. We don't want to do our homework; we don't want to find out who is contesting, their strengths and weaknesses and then make an educated choice rather than just complain about why the system isn't working. Mumbai has a wonderful site called mumbaivotes.com (external link), which gives you updates that matter. adrindia.org is a great resource even if you aren't a Mumbaikar. Party manifestos give you an idea of what you can expect from the party should it come to power. Newspaper reports are another great source of information that we rarely ever look at. Read these documents, browse through these sites, take everything with a pinch of salt and make a choice you won't regret. As a country, we haven't done a bad job of running it for the last 66 years and I feel we can only do better from here on. Today, we are a country with a large number of young people, people willing to educate themselves with amazing ideas for this country. The youth is willing to believe that we can make it work. I am one of them. Malvika Bhatia is the head of recruitment and talent management at knowyourvoteindia.org, a non-profit organisation that works towards addressing voter apathy amongst India's youth and empowering it to demand accountability and play an active role in India's governance. She spoke to Abhishek Mande. 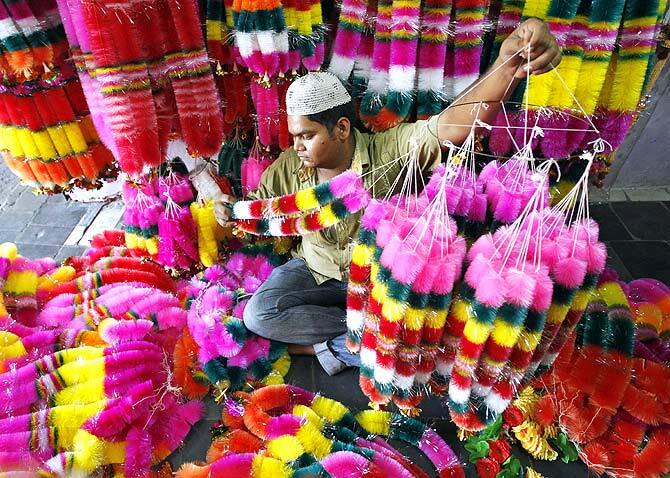 Image: A vendor arranges garlands for sale in his shop before the festival of lights, Diwali in Ahmedabad, Gujarat.